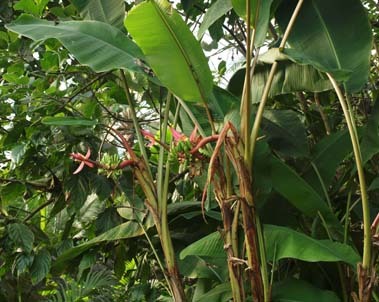 Only 1,2m (4ft) tall, leaves have a pinkish coloured midrib. The flowers are pink to orange and the very ornamental fruits, are a bright, velvety pink. The fruits are edible, but also full of seeds. This species is quite cold tolerant and can survive outside in South Western Britian if heavily mulched. Alternatively it makes an excellent indoor plant and is one of the few bananas that will actually flower and fruit indoors.